News: SpeedPro Imaging Northern Virginia hosted a holiday open house and art show at its studio featuring works by local professional and high school artists. News: SpeedPro Imaging Northern Virginia celebrated its grand opening by unveiling an annual charitable program through which the company will donate a portion of its gross profits to a Northern Virginia charity. 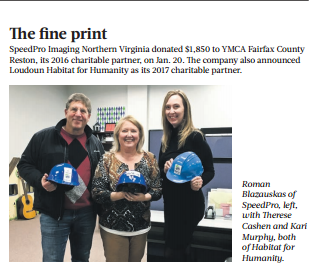 For its inaugural year, SpeedPro NOVA selected Loudoun Interfaith Relief, a nonprofit providing emergency food assistance, as its charitable partner.